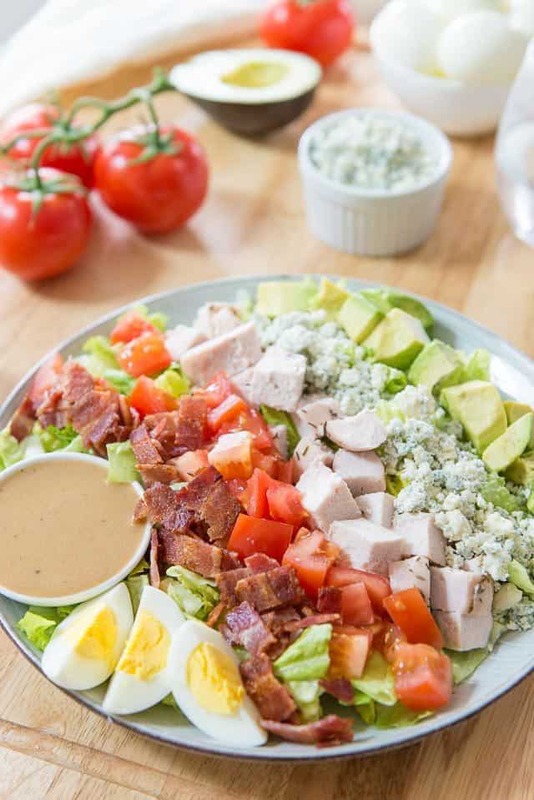 Cobb Salad - A healthy salad that's filling enough to be the whole meal! Salad combinations are endless, but Cobb Salad has got to be one of the greatest salads of all. While most salads only have enough heft to be served as a starter or side to a meal, a Cobb salad can be the whole meal itself (this Steak Salad is also enough to be the full meal). It’s incredibly filling and satisfying, and hits all the different nutrient components. You get plenty of protein, healthy fats, fiber, and vitamins all in one bowl. 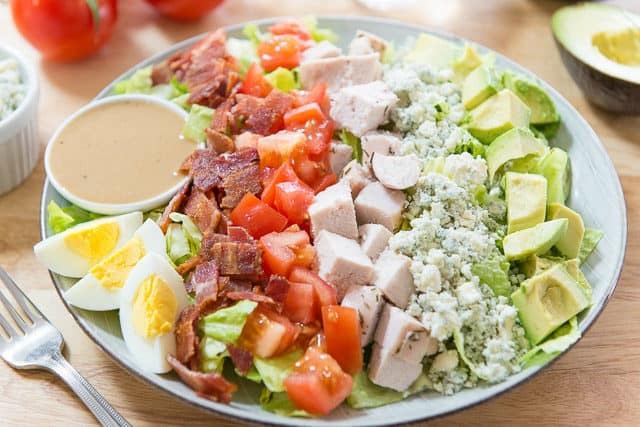 Cobb salad originates from southern California dating back to the 30s, and I think it definitely says something that it has stuck around so popularly since that time. I often see it on restaurant menus, and it’s one of my staples at home. 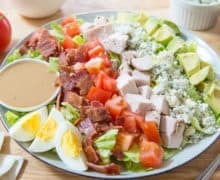 Since Cobb salad has been around so long, there are tons of different versions, but this is the collection of ingredients that I like the best, and come back to again and again. The nice thing about the Cobb Salad is that most of the components can be made ahead. With the right ingredients on hand, it can be made in less than 10 minutes. The first thing I do is roast some bacon. I used to fry bacon in a skillet, but I’ve become a convert for the oven method. It’s so much easier, and the bacon comes out just as crispy. 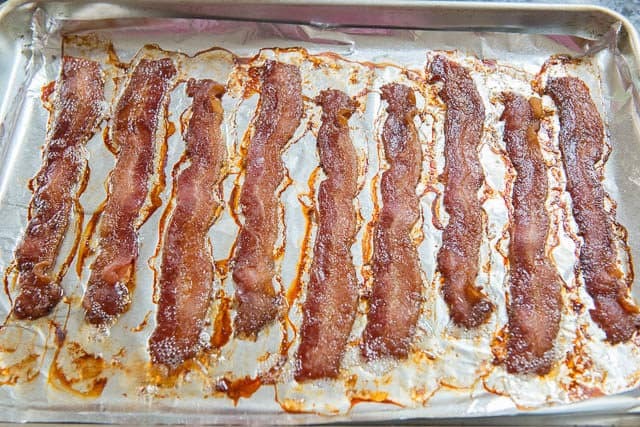 Here’s a post on How to Cook Bacon in the Oven. When I make bacon, I usually cook the whole package and keep any leftover strips in a container in the fridge. Just re-warm in the oven or microwave when you want to eat it next. 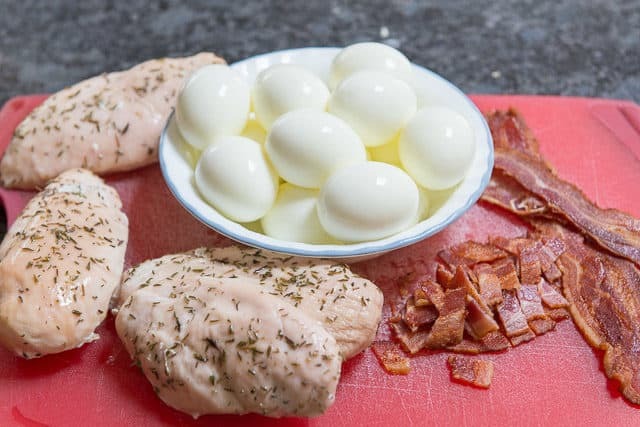 In addition to the bacon, you need some chicken breast and hard-boiled eggs. I always have chicken breast on hand via my Crockpot Chicken Breast method, so I have protein available to add to salads like this. All you have have to do is place boneless, skinless chicken breasts into the bottom of a slow cooker and season with salt, herbs, spices, or whatever you’d like. Then set it to low and let it cook gently for a few hours. 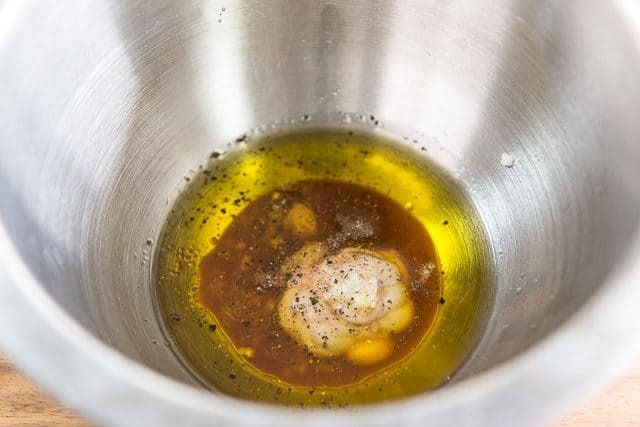 For perfect hard-boiled eggs, I use this Easy Peel Hardboiled Eggs method that I shared long ago on The Pioneer Woman’s site. In a nutshell, place eggs in boiling water for 12 minutes, then place in an ice bath for a few minutes to chill, and peel. The ingredients are quite simple, but it goes nicely with the bold flavors that are already there in the salad, like the salty bacon and blue cheese crumbles. Make sure the lettuce is thoroughly dry. Wet lettuce will dilute the dressing and make the salad much less enjoyable to eat. I usually spin it dry as well as I can, then dry further with a kitchen towel, since spinning only does so much. 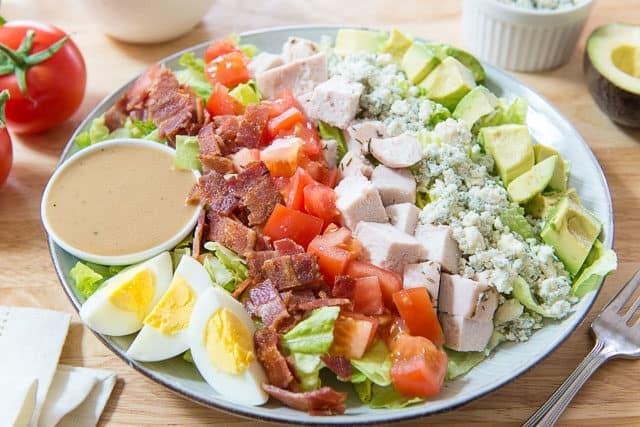 The Cobb Salad is all about the combo of ingredients if you ask me, and this presentation shows them off nicely. I tend to keep the dressing on the side, but you can also toss everything together if you prefer. Shrimp Salad and Chicken Salad are some of my other favorite make ahead lunches. Enjoy! Can Cobb Salad be made ahead? Kind of. Like any other salad, do not toss the ingredients with dressing until right before serving. But many of the components can be made ahead of time, like the chicken breast, bacon, and eggs. The dressing can be mixed together ahead of time, and the tomatoes can be chopped ahead too. Can you store Cobb Salad leftovers? I’ve tried, and the leftovers are not good, mostly because romaine that’s been dressed doesn’t keep well. If you used a sturdier green, like kale, leftovers would be okay for a day. Is Cobb Salad healthy? Yes! It is low carb, gluten-free, and has quite an array of nutrients from all the different ingredients, plus lots of protein and healthy fats. This Cobb Salad is the perfect hearty and healthy lunch, thanks to a great combination of ingredients. It has crispy bacon, salty blue cheese crumbles, creamy avocado, and a simple dressing to tie it all together. 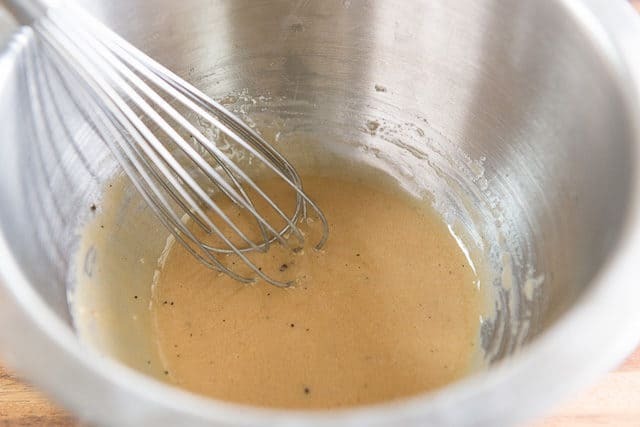 To make the dressing, whisk together the olive oil, mustard, red wine vinegar, garlic, salt, and pepper, until combined. 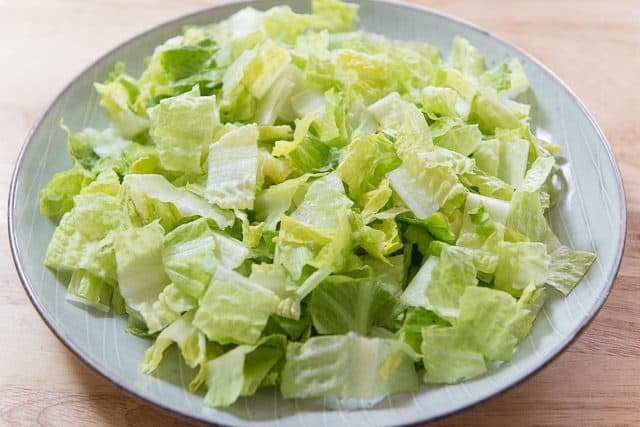 Place the romaine lettuce on a plate or low bowl, and arrange the remaining salad ingredients in rows on top of the lettuce. Pour the dressing over the salad right before serving, and enjoy! Post updated with new photos and writing April 2018. Originally posted May 2012. Perfect version of the Cobb Salad!